for digital marketers, designers and teachers. Without paying one penny you can own the amazing cartoon animation software easily. Besides having no worry about the budget, you can also feel free about the operational issue. 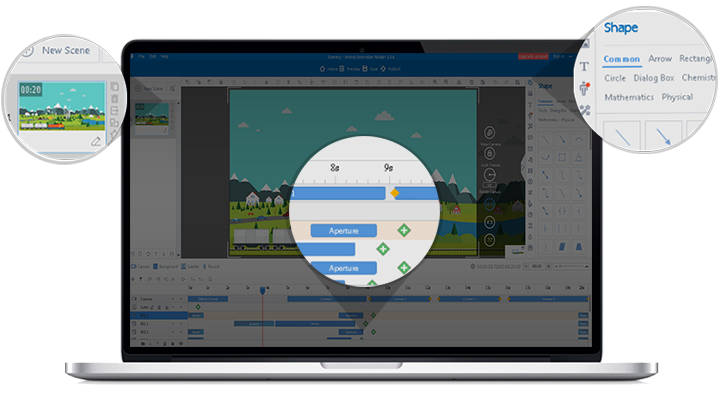 Animiz offers tons of pre-designed materials including templates, backgrounds, images, animated characters, animation effects and more. Everyone can smart apply this cartoon animation software. 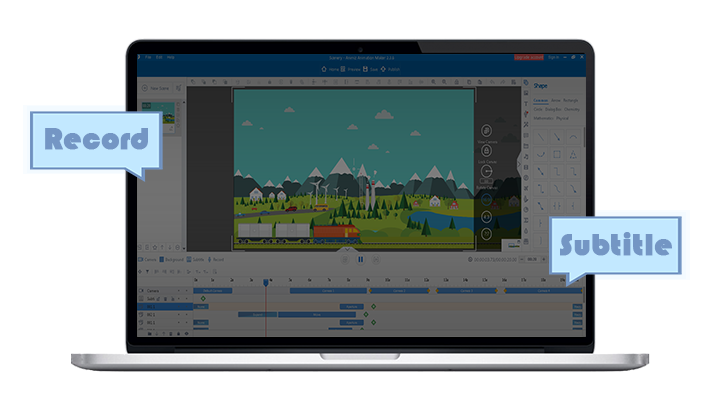 With the powerful drag-and-drop function, make your professional video easily and publish it in multiple formats. Want your cartoon animation video standing out from the crown? Animiz gives you the chance. Almost everything in your video can be made by yourselves. Express your creative thinking with the dazzling material library. Put together all the pieces into a wonderful work. Get your cartoon animation video under your won operation. The final cartoon animation video should include music, animated characters, animation effects, beautiful background, animated scenes and other multimedia. The animated video is sure to surprise your audiences. Actually, as for a successful animation video, the subtitle and recording play the important role in your video. Increasing the readability and intelligibility, subtitle and recording can embellish your animation video easily. Of course, that is quite simple to insert subtitle and recording in Animiz. Just with the Timeline, you can free to add caption and voiceover as you like. In addition, make them synchronously play in each scene to keep step with your video contents. Amaze your audiences with these elaborate arrangements. No any designing skills? No any animation creating experience? Animiz powerful animation effects help you out. 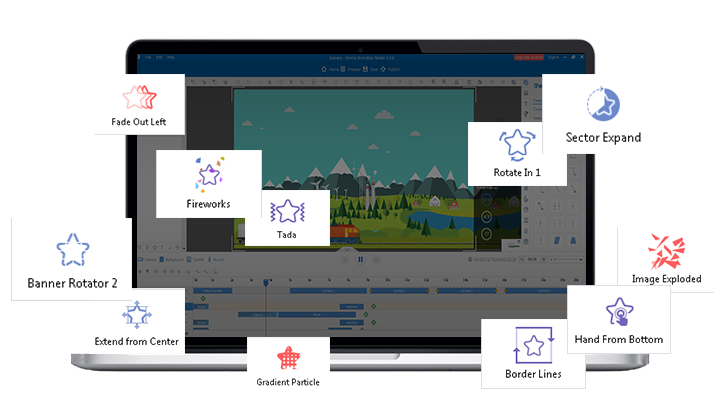 There are 300+ splendid animation effects available for you. Choose and apply to your video. What you see is what you get. Easily create your own animation with the combination of entrance, emphasis and exit effects. 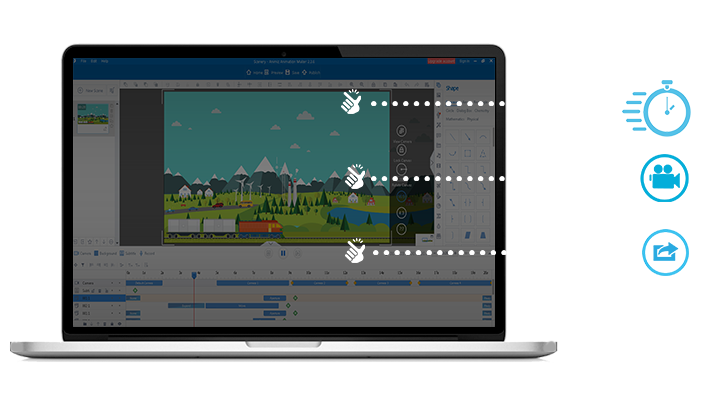 Not only that, there are various kinds of transition animation effects for your scenes, improving the fluency and attraction of your video.